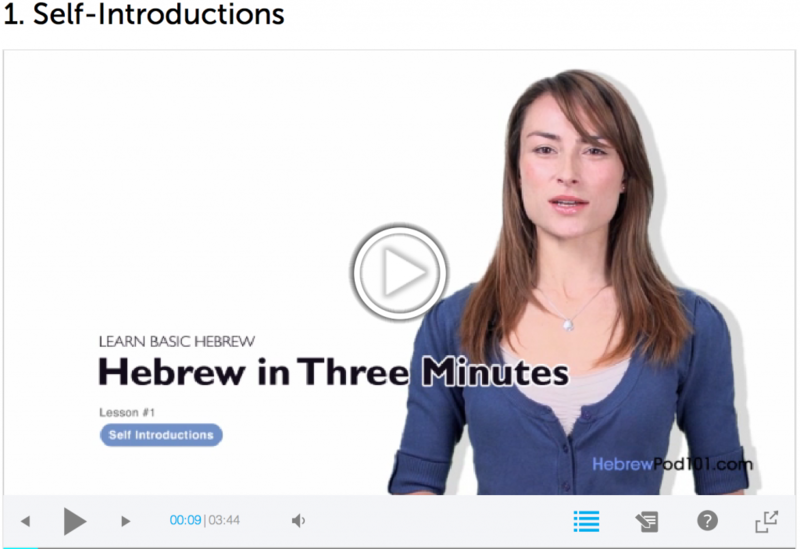 There’s a really good tactic to learning to speak and understand modern Hebrew conversation. Hearing real Hebrew conversation examples – audio or podcasts – first. Re-listening now that you know the meaning. So, why the first three points? Simple. Because your brain uses background information to make sense of new information. If you hear unknown Hebrew for the first, you won’t get it – that’s natural because your brain has nothing to refer to. Once you know the meaning, your brain will now refer to it. You can see how exactly this method works with the experiment below – just press play to listen. The experiment titled “Audio Illusion” is not related to language learning, but is applicable anyway. Now, back to learning Hebrew. Listen to this short 0:14 second dialog. And below you’ll see the translation and meanings. The translation & meaning from HebrewPod101. Feel free to read this alone or read it while you’re listening. Now, re-listen to that Hebrew dialog and you’ll obviously begin to understand it better now right? It’s the same concept applied to language learning. The playlist of Hebrew ONLY lessons/dialogs that you’ve already learned is incredibly valuable in mastering the language. Yes, you’ve already listened to them but… the magic is in reviewing. Why? It’s a good way to test yourself: You can refer back to the lessons if you don’t know a word. If you have 20 pure HEBREW dialogs in your playlist.. and understand all of them completely, that’s serious progress. Coming back to review is great to refresh your memory. It’s a great source of immersion. No English. Here’s an example of my current playlist. If you’re interested, here is my process of how I improve my Hebrew listening and speaking skills with this method. I listen to a lesson and read along with the transcript on HebrewPod101. The lessons are usually 5-15 minutes. By reading along and getting the translations, I can now listen to the Hebrew without translations. I listen again without translation to see how much I’ve mastered. This takes 1 minute. After I finish listening to the lesson overall, I download the Hebrew only dialog track to my iPhone or computer. I create a playlist of Hebrew only dialogs that I can listen and cycle through to ensure I’ve mastered the conversation presented in this lesson. This is where the video above comes in. I return to the playlist time and time again to improve and refresh my memory. Mastery is achieved with enough listens. And this is very useful as I can take the lessons anywhere with my iPhone and listen in. Now, you tell me. Have you tried the “Listen first, read, then re-listen” method before? And do you keep a playlist of Hebrew only material for complete immersion? Leave a comment below.